Having worked with lemongrass before, in Thai curries and soups, I knew I would have to coax the flavor out of these tough, little stalks. The key, I found, was to search out the freshest specimens possible and peel away the tough outer skin. The next step was to chop a whole stalk and steep in the liquid intended for the cupcakes. The end result was deliciously sweet and moist with a subtle lemongrass flavor that paired well with the very coconuty frosting. But I have to be frank… when I tasted the batter it was really bringing back taste memories that I struggled to recall. When it finally hit me, I was almost disappointed. 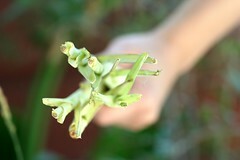 How could something as exotic as lemongrass remind me of the milk at the end of the bowl of fruity pebbles! The baked cake lost its fruity pebble flavor, thankfully, and I was quite pleased with the cupcake overall. 1. 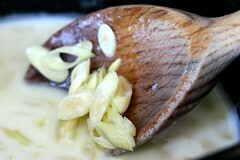 Bring milk and lemongrass to a gentle simmer for about three minutes. 2. Turn off heat and let cool until warm. 3. Transfer about half of the milk and most of the lemongrass solids into a blender and pulse for about 30 seconds. 4. Transfer everything back into the pan and let cool fully. 5. 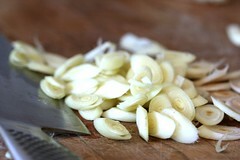 Add chopped lemongrass to the lemongrass milk. 7. Add about one third the lemongrass milk and beat until combined. 8. Repeat above, alternating flour and lemongrass milk and ending with the flour mixture. 2. Add the sifted powdered sugar and lemongrass milk. Beat until smooth. [Optional] Chop unsalted peanuts with some kosher salt until fine. Sprinkle over cupcakes. They look lovely. Sadly I have adverse reactions to lemongrass so I will only admire these from a far. The new site looks great – congrats on the move. 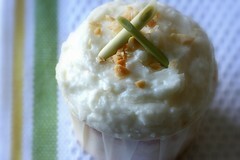 And the lemongrass cupcakes sound delightful! this looks wonderful. I was just recently thinking about what it would be like to bake with lemongrass as that, like you said, it is such a great flavour in curries and soups. Thanks for another beautiful post. 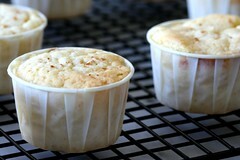 i like the new site, and look forward to many many more lovely cupcake recipes! Thanks, I hope the move isn’t too much of an inconvenience :) Hopefully I can figure out the redirect think which should help. I have yet to try out your recipes but they look so interesting and tasty and your photography is fabulous! that’s funny, I once had some thai food that tasted exactly like fruit loops; must have been the lemongrass! Congrats on the new site! And those new cupcakes look divinely shibby! Congratulations on the new site! Good for you! I’ve just started my own blog – TastingLife. The new site looks great! Previously I just lurked but I came up out of the woodwork to say congratulations. I pretend I’m allergic to coconut because I just don’t like it, but these look really delicious! I love your experimental cupcake recipes, I didn’t know that baking could be so intriguingly flexible. lovely idea and I’m glad they turned out well. I love reading about your experimental cupcakes. Congrats on the new site, it looks wonderful! Very surprise eventhough I’m Thai, I had never thought to add lemongrass flavor to any cakes….. But I enjoy to drink lemongrass water…. I’m looking forward to see more Thai herp on your cupcake! These are wonderful! I made them over the weekend and they were a huge hit with friends and co-workers! A question for you, though, did you keep the lemongrass solids (post-blender) in the milk? Mine seemed a little chunky, so I pushed them through a mesh strainer and tossed the big pieces that wouldn’t go through. I think next time I would chop it finer. These cupsckes look wonderful. Perfect for a brunch with the girls. I’ll be making this for a lemony tea my herb group is doing in January. Lemon balm is national (U.S.) herb of the year but our group is celebrating ANY herb that has lemon flavor or scent. I’ve got the plant growing indoors right now and want to harvest. Looked everywhere for something appropriate for a tea made with lemongrass. Can’t wait to try. New to the site, but I’m a pastry Chef near my home town in Michigan, and I love the creative idea of adding the lemongrass to cupcakes. I hope you don’t mind if i borrow the idea and try a lemongrass poundcake? Hi! Where did you buy the cupcake papers? they look much nicer than traditional liners! I think I almost died when I made these today. They are delicious. Hey! This looks really yummy! Unfortunately, I’m unsure of where to go to buy lemongrass…. I’ll try the oriental stores around here, but Iowa lacks many exotic produce, being landlocked… any ideas? G’day! I was “inspired” by your Lemongrass Milk recipe and made Coconut, Hibiscus and Lemongrass Ice Cream the other day TRUE! Loved the simplicity and versatility too! Here’s a photo should you like to view! Thank you! Look forward to making more of your recipes in the future too!